FAST-PUR 12: Your favourite foamset when it comes to mobile use. 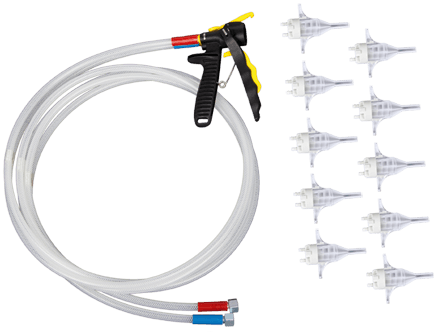 The metal handle allows you to hold the foamset in one hand while operating the spraygun with the other. Mostly used with the GHA 9ft gun hose set. 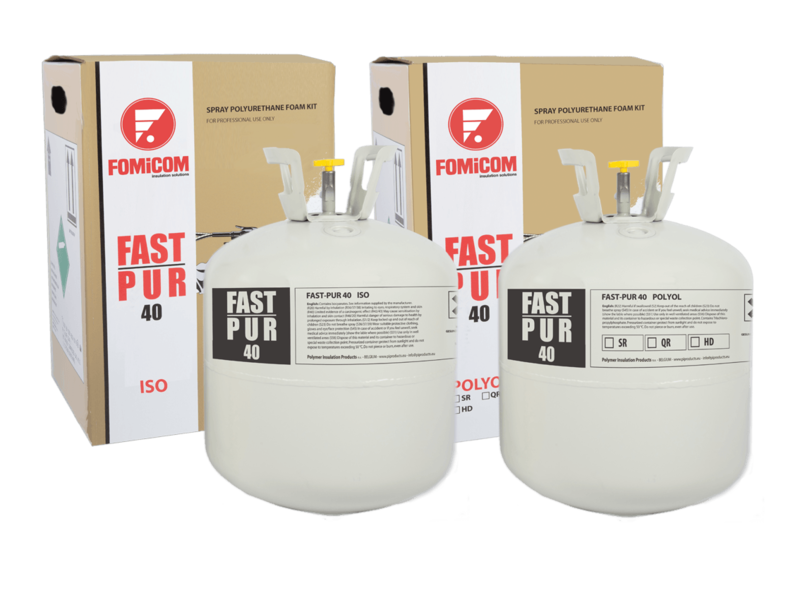 FAST-PUR 40: Need a big volume of foam? With a yield of more than 1 cubic meter of PU foam, the cylinderset is perfect for big insulation jobs in situ. Mostly used with the GHA 15ft gun hose set. FAST-PUR 125: The XL set of the FAST-PUR product range. Used in manufacturing and big construction projects. 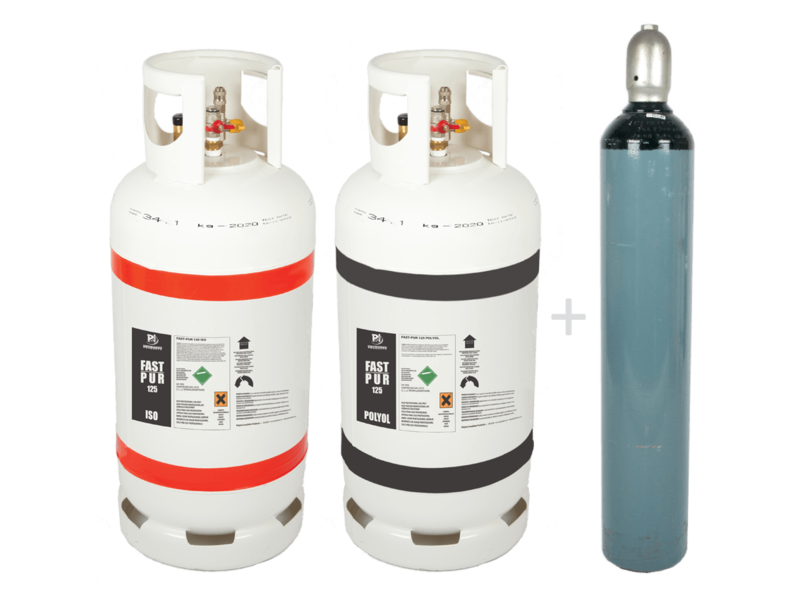 Refillable cylinders and nitrogen…that’s all it takes. 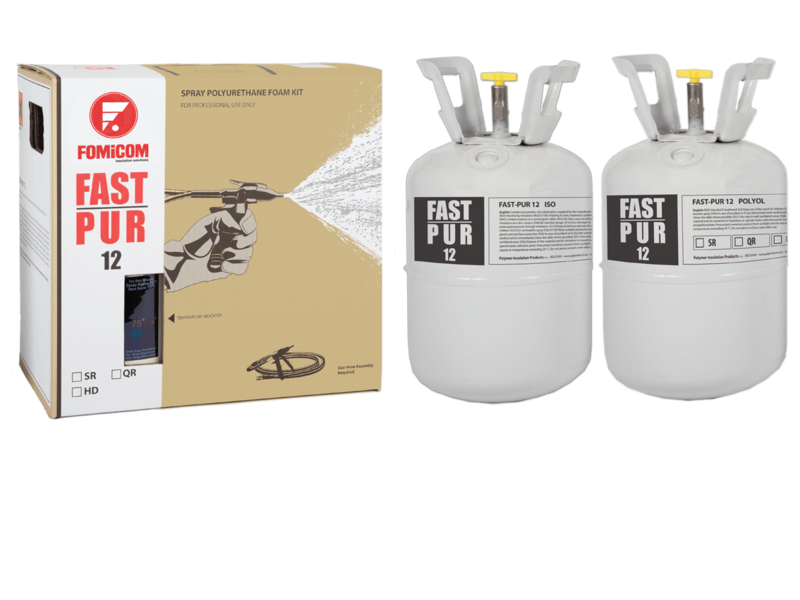 The FAST-PUR 12 products are sold in a kit where an isocyanate tank is combined with a polyol tank. Depending on application we opt for the slow rise, quick rise or high density polyol. Two hoses connect the separate tanks with the spray gun. The nozzle which clicks onto the spray gun allows uniform mixing of the two basic components of the insulating polyurethane foam. The kit contains 2 disposable pressurized tanks which must be connected with hoses to a spray gun. The package has a metal handle allowing you to move the kit while working. The total gross weight of the kit is approximately 17kg. The FAST-PUR 40 products are always used in a combination; an isocyanate tank combined with a polyol tank. Depending on application we opt for the slow rise, quick rise or high density polyol. Two hoses connect the separate disposable tanks with the spray gun. The nozzle which clicks onto the spray gun allows uniform mixing of the two basic components of the insulating polyurethane foam. The separate tanks are pressurized and have a gross weight of approximately 25 kg. The refillable FAST-PUR 125 products are always used in a combination; an isocyanate tank combined with a polyol tank. Depending on application we opt for the slow rise or quick rise polyol. A nitrogen tank is connected to the two basic components by means of a double pressure regulator. Two hoses connect the separate tanks with the spray gun. The nozzle which clicks onto the spray gun allows uniform mixing of the two basic components of the insulati ng polyurethane foam. The separate tanks are pressurized and have a gross weight of approximately 95 kg. 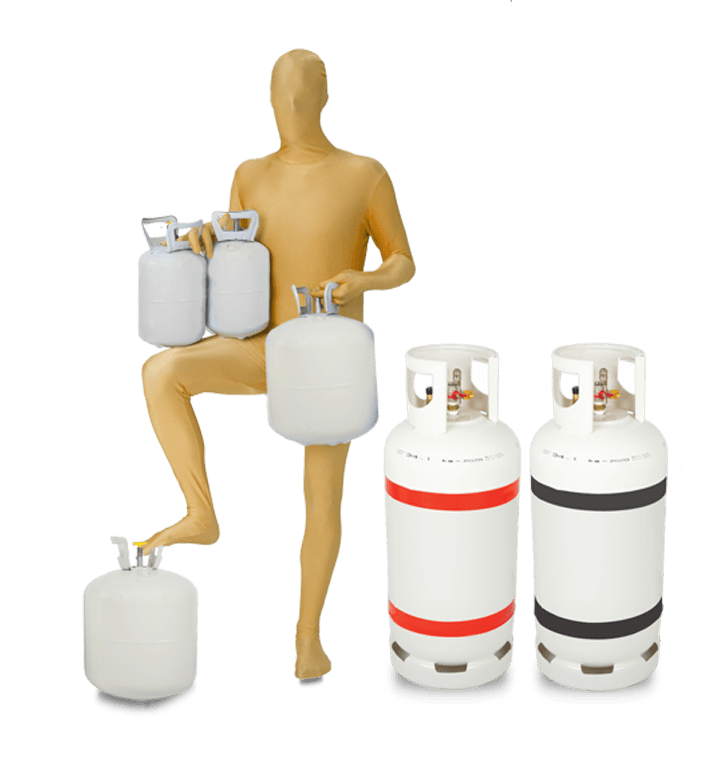 The tank is refillable and is charged with a deposit which is reimbursed on return of the cylinder according to our general sales conditions. Please note that these videos are FROTH-PAK videos, a Fomicom 2K sprayfoam with the same properties as FAST-PUR. FROTH-PAK is used in Europe, FAST-PUR is used outside Europe. What is the insulation value of FAST-PUR? The relative insulation value of a material is expressed as a reversed -value (Lambda). The Lambda value of FAST-PUR is 0,022 W/mK. The lower the Lambda-value, the better the material insulates. The absolute insulation value of a material is expressed as the R-value, and depends on the thickness of the material. The R-value of FAST-PUR is 0,45 m² K / W per cm thickness. The heat conductivity is expressed as the K-factor which equals to 1/R. The FAST-PUR system is characterized by its fast and simple mounting: two cylinders with the individual components and the gun hose assembly (GHA). The GHA is a gun with hoses, nozzles, spanner, vaseline, and instructions. You only need some appropriate clothing and safety glasses for immediate start. What safety precautions must be taken when using FAST-PUR? Before using the FAST-PUR kit it is mandatory to read the MSDS that lists what precautions that must be taken. Eg. protective clothing, ventilation in closed space, … The basic components, isocyanate and polyol, require certain measures to protect the skin and body. Once the FAST-PUR foam is cured, it is inert and harmless. How can FAST-PUR help to fulfill the EPB regulations in case of a renovation? FAST-PUR has a higher insulation value than conventional insulation materials. With equal thickness of both types of insulation, higher R-values are obtained with FAST-PUR. Because of the fact FAST-PUR is an air-and moisture-tight sealing you will also avoid unnecessary drafts and you will easier meet to the ventilation standards. As with every organic product, FAST-PUR insulation will burn in a fire. The product will however not contribute to the fire. Once the source of the fire is removed, the foam will not continue to burn. FAST-PUR is Euro Class E certified. For further details, we refer to the MSDS sheet. To which materials does FAST-PUR adhere? FAST-PUR spray foam adheres to all materials, with the exception of certain plastics such as polyethylene film or PTFE (Teflon). The surface must be damp and dust free, and should not be tainted with oily substances. What are the advantages of FAST-PUR spray foam in comparison to traditional insulation? What is the noise insulation capacity of FAST-PUR? FAST-PUR spray foam will, depending on the applied layer, absorb a part of the sound or vibration. This can result into a noise reduction of 50%. It is important to note that this reduction factor is strongly related to the carrier of the foam (a metal surface will has less good results in comparison to a wooden surface). How much FAST-PUR is needed for a given thickness? What’s the expiry date of the FAST-PUR tanks? Yes. One of the components of the FAST-PUR insulation foam is isocyanate, which blocks the used hoses after a while, depending on the storage conditions. Therefore it is necessary, when not in use, to flush the hoses once a week to put new product in the lines and avoid blocking. If the GHA kit is not used for several weeks/months, the GHA kit can be cleaned with the Cleankit assembly PU cleaner, sold by Fomicom. 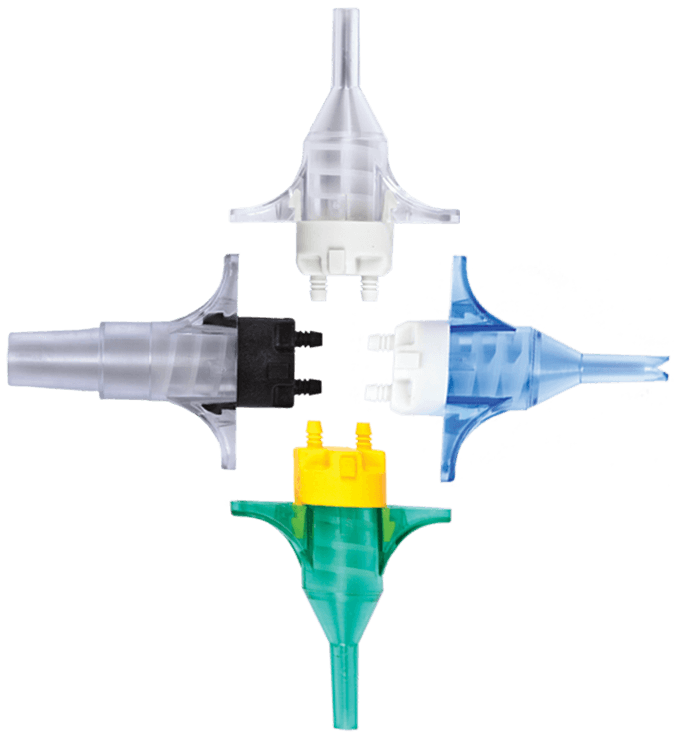 The Cleankit assembly makes it possible to perfectly clean the hoses and the spray gun on the inside, so it can be stored for a longer period between two applications. Is FAST-PUR waterproof and can it be used for shipping / fleet applications? Yes, the two components FAST-PUR foam consists of more than 95% closed cells which makes it waterproof. Is FAST-PUR suitable for outdoor use?